Hillary Clinton should hope for another Rick Lazio moment in her debate with Trump. 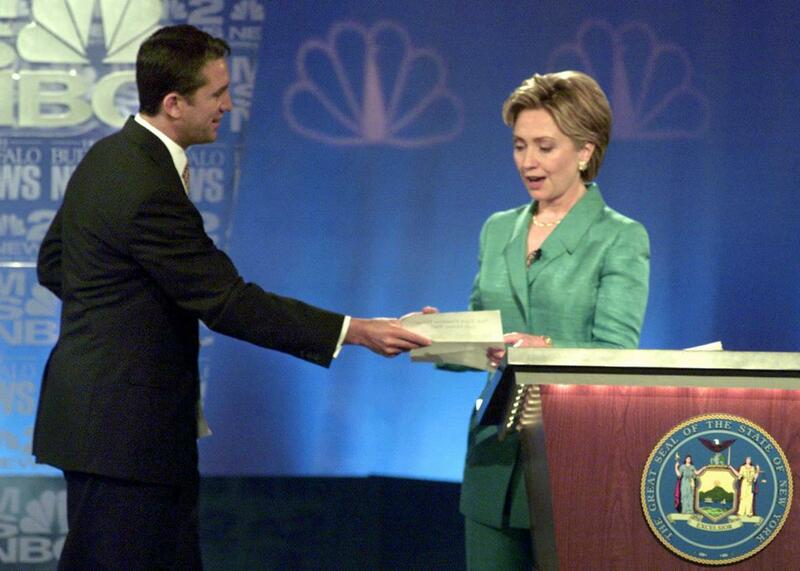 Rep. Rick Lazio attempts to get Hillary Clinton to sign an agreement not to use soft money in their U.S. Senate race at their first debate on September 13, 2000, in Buffalo, New York. How can Hillary best Trump in their first presidential debate? It’s a question with no obvious answer, given that Trump refuses to follow the rules of politics (or civil society) and has cultivated very low expectations. Democrats—and everyone who hopes to defeat a narcissistic fascist in November—hope that Hillary will be able to provoke Trump into bad behavior and highlight the discrepancy between her mastery of issues and his simplistic, ignorant worldview. But exactly what a win would look like remains to be seen. However, there is one model Hillary could look to: her first debate with Republican Rick Lazio, then a U.S. Representative, in the New York Senate race of 2000. In that debate, Lazio memorably embodied all the qualities people like least about entitled men, and Hillary came off looking amused but unruffled by Lazio’s unforced error. It’s the height of hypocrisy to talk about soft money when she’s been raising soft money by the bucketload out in Hollywood and spending all that money on negative advertising. Height of hypocrisy. Let’s just get this deal done right now. Right here. Here it is. “Well, yes, I certainly do,” she said with casual, barely contained laugh. “I admire that, that was a wonderful performance, and you did it very well,” she told Lazio, sounding like an elementary school teacher congratulating a student on his hard work. “I’m not asking you to admire it, I’m asking you to sign it,” Lazio replied petulantly, falling into the schoolchild role unwittingly. “Right here. Right here. Right here. Sign it right here,” interrupted Lazio as he left his podium and approached Clinton’s. “We’ll shake on this right now,” Clinton offered as Lazio invaded her personal space. Her body language was familiar to anyone who’s ever tried to escape from an overzealous conversationalist at a party. The altercation went on for another few moments, as Hillary brought up a Republican radio ad that benefited Lazio and Lazio yelled, “What are you talking about here? Let’s put things in perspective.” And it likely would have gone on like that, with Hillary cool as a cucumber and Lazio increasingly unhinged, if Tim Russert had not called time on the debate. It’s not the content of Clinton’s response to Lazio that’s striking so much as the tone. With a surprised but calm demeanor, a sense of humor, and an overall attitude of being above it all, Clinton made herself look like a grownup, while Lazio made himself look like a lunatic. As she’s shown time and time again, Hillary is most likeable when she’s under attack. She’s also very good at playing the straight man when other people are going off the rails—we’ve seen this most recently in her Between Two Ferns interview with Zach Galifianakis. If Hillary can elicit another Rick Lazio moment from Trump, she’ll be able to play the situation to her advantage, just by being herself.